World’s largest container shipping company Maersk Line will move 16 containers on river Ganga (National Waterway-1) from Varanasi to Kolkata tomorrow. 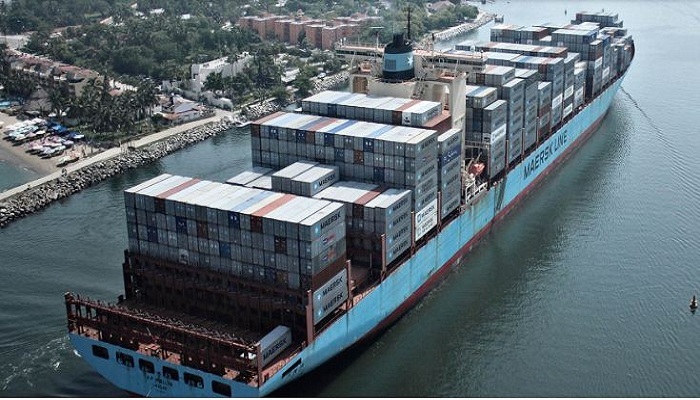 Maersk moves 12 million containers yearly across the globe. The firm is onboard India’s inland waterways for the first time. Maersk moving containers on river Ganga follows similar movements already done by firms like PepsiCo, Emami Agrotech, IFFCO Fertilizers, Dabur India. With Maersk on board, the cargo from the hinterland will move directly to and from Bangladesh and rest of the world through Bay of Bengal. On November 12, 2018, Prime Minister Narendra Modi dedicated India’s first riverine multimodal terminal on river Ganga (National Waterway-1) at Varanasi to the nation. On the same day, he also received country’s first container cargo that travelled on river Ganga (National Waterway-1) from Kolkata to Varanasi. The twin events marked watershed moments in the development of Inland Water Transport (IWT) in India and also broke grounds for a spurt in business activities on National Waterway-1. Container cargo transport comes with several inherent advantages. Even as it reduces the handling cost, allows easier modal shift, reduces pilferages and damage, it also enables cargo owners to reduce their carbon footprints. The government is developing NW-1 (River Ganga) under JMVP from Haldia to Varanasi (1390 Km) with the technical and financial assistance of the World Bank at an estimated cost of Rs 5369 crore. The project would enable commercial navigation of vessels with capacity of 1500-2,000 DWT. The Union Minister for Shipping Nitin Gadkari had flagged off a consignment of Maruti cars from Varanasi to Haldia in August, 2016. Since then pilot movements on National Waterways are currently being done on various stretches. More than 15 of them have already been successfully completed, including integrated movements through NW-1 (Ganga), Indo-Bangladesh Protocol Route and NW-2 (Brahmaputra).